Is pre-mixed water based acrylic adhesive, recommended for interior wall and floor installations. It is manufactured with styrene-acrylic emulsions, first quality additives, and graduated inert aggregates. 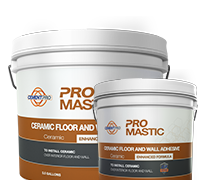 It is recommended to install ceramic over interior floor and wall. Suitable for wet areas such as tub surrounds and shower walls. It can be applied over concrete, masonry, plaster, backerboard, gypsum board and plywood. Do not use in exterior.